When it comes to traveling at night, safety is important – no matter which mode of transportation that you choose. If you happen to skateboard at night, new 3D printed “Shredlights,” may be just what you need to keep safe. Shredlights are lights that mount onto your board to help offer additional safety and visibility during a night skate. 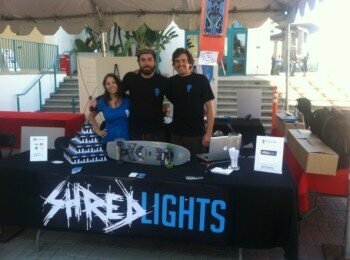 Drew Page, the founder of Shredlights, has spent the last 15 years in the skateboard industry. Page was inspired to create the lights after a late night ride home from the store, when he ran into some unseen rough road leading to a less-than-pleasurable fall that night. A3D Labs, founded in June 2013 by Jennifer Wood, Travis Wyatt, and Alex Weiss, has teamed up with Shredlights to create the 3D printed skateboard lights. The lights were printed on A3D Labs’ flagship 3D printer and mount on the underside of your board in front of the wheels. Not only do these lights help you to see where you’re going when skating after dark, they also help to make you more visible to drivers, and of course, they add an extra cool factor to your board at night. While Shredlights are designed to make the road more visible and your ride safer, they do not guarantee your safety, and it is still important to comply with your states regulatory laws involving skating after dark.